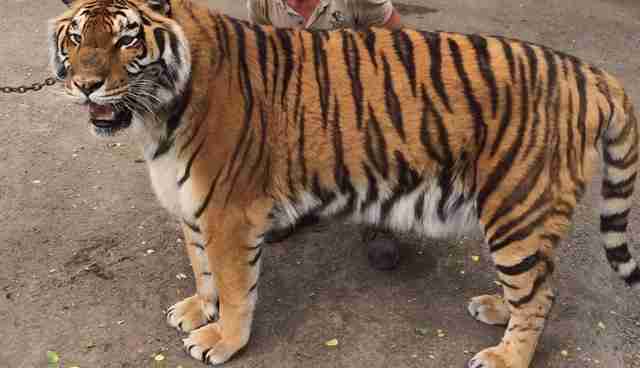 A zoo that was filmed abusing one of its tigers is shutting its doors for good - thanks in no small part to the outrage of former customers. Back in December, a video was released showing Michael Hackenberger, the co-owner of the Bowmanville Zoo in Ontario, Canada, appearing to repeatedly whip one of his tigers during a training session on the zoo's grounds. Hackenberger, a well-known animal trainer who's worked on popular shows and films including "Life of Pi," can be seen cracking his whip up to 19 times while the tiger, a young male named Uno, lies on his back cowering. Hackenberger also shouts curses at the frightened animal, later appearing to whip the tiger in the face. "I like hitting him in the face," he says. Immediately after the video was released, Hackenberger denied the clip, saying he had only hit the tiger twice and that PETA - which released the video - had manipulated the footage. But in January, another clip emerged showing Hackenberger speaking almost gleefully about beating his animals. "I can carve my initials in their side," he brags of his skills at whipping tigers. Later, speaking about a group of wolves, he shows off the wooden stick he uses to beat them. "He's still a wolf," Hackenberger says. "You smack 'em, and they generally fold like a house of cards. And that's the beauty." "He's very afraid of it," an employee chimes in about the wooden rod. 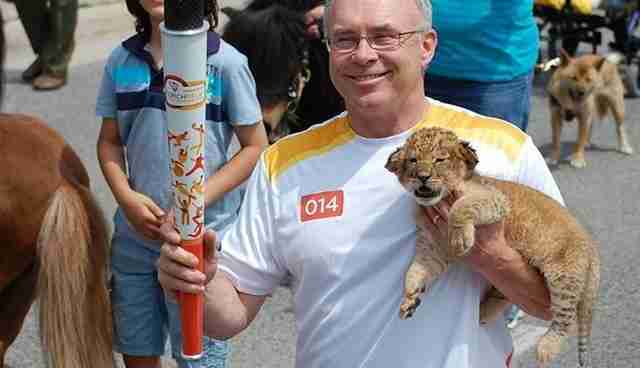 Hackenberger resigned as the zoo director in April after he was charged with five counts of animal cruelty, though he appears to retain partial ownership. Investigators discovered that he had also abused the tiger by pushing his finger into his eye. But on Thursday, when Bowmanville Zoo announced that it would be closing its doors for good at the end of the season, the facility continued to deny the accusations of abuse - and blamed the decision on a public that refused to support the alleged abuse. "The untrue allegations made by PETA in regards to a tiger incident have created a climate in which the zoo can no longer operate," the zoo said in a release. "People are staying away because they believe PETA's allegations. The fact is PETA released only a short piece of a long video, and then misrepresented what transpired in that short part. What they said is not true, but it doesn't matter - the damage is done." But despite the zoo's protestations, Hackenberger's tiger beating was just the latest in a series of problems. The zoo had already been placed on probation last year by Canada's Accredited Zoos and Aquariums (CAZA) - the country's top accreditation group, of which Bowmanville Zoo was a member - for undisclosed violations. In another incident, Hackenberger was heard cursing at his animals on a live television show, when he called a baboon a "cocksucker" for falling off a miniature horse during a stunt. Bowmanville Zoo also hosted "cub petting parties," a controversial practice that always involves abuse. "The verdict is in, people vote with their feet, and they have voted here," Angus Carroll, the zoo's communications director, said at a press conference on Thursday. "There are people staying away in droves and we can't afford to operate the zoo." However, while the zoo's closure could mean a measure of improvement for the animals in its care, they're not safe yet. As the zoo - and likely Hackenberger, by extension - still owns the animals, it will likely relocate them to similar institutions, or keep them on the ground for continued "training." "It's not clear that the zoo will be closing in reality," Wildcat Sanctuary, a rescue for tigers and other big cats in Minnesota, wrote on its Facebook page, quoting a source in Canada. "Rumors are that someone will be buying it and turning it into another sort of roadside zoo. And there is a place that recently opened right near that zoo by people who have worked with Hackenberger for many years. It's suspected they'll essentially just open under a new name." However, for now, the animals are one step closer to freedom. And with the cruelty case currently ongoing, it's possible that the continued public pressure could ensure the animals' safety. If the Bowmanville Zoo case shows anything, it's that public outcry on behalf of animals really can make a difference - and for know, that means the death knell for at least one troubled facility.